Destinations are the various places that a call can be routed to within the system. The destinations drop-down list is populated as destinations are added to the system. During system implementation, if destinations are populated first it is easier to provision the hardware trunks because all of the destinations will be available in the drop down menu. These system destinations should be obtained in advance to simplify the setup process. In most cases, there will be a menu to setup for an automated attendant. There will also be business hours to setup. We recommend that you use the IPitomy Setup Worksheet to help you gather and organize the necessary provisioning information prior to installation (see the figure below). The Setup Worksheet can be found on IPitomy’s website. (Please refer to the “Installation Worksheet” section of this user guide for details on how to use the Setup Worksheet). Extensions: are individual extensions assigned to a telephone. When an extension is created, a voicemail box is also created. This voicemail box is automatically the destination for an extension call which exceeds its ring time. Groups: are groups of extensions that can have different ringing strategies and can be routed from any trunk, another destination or dialed from an extension. 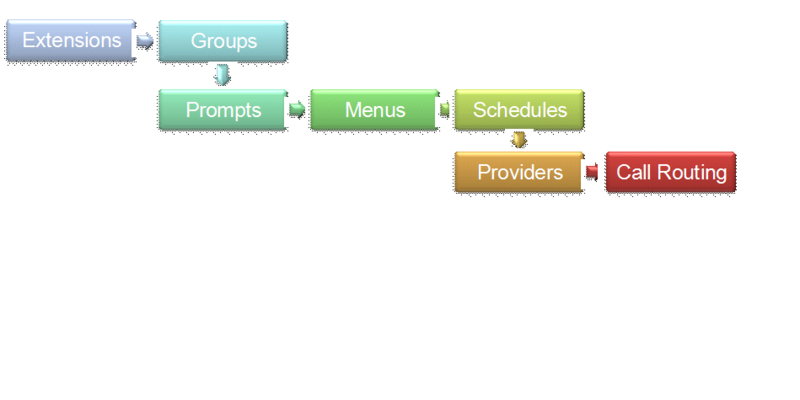 Menus: are used for creating automated attendant menus to route callers to different destinations within the system. The voice prompt can also be used to play information like driving directions. Conference Rooms: allow multiple users to participate in the same call. Callers can be routed to a Conference via; direct dialing, through a DID, using an automated attendant or transferred by a person. Voicemail Boxes: are where callers leave a message when someone is not available at an extension. Voicemail boxes that are created separate from extensions can be used to route callers after hours or as an overflow destination. Note that in the current implementation Voicemail Boxes without an extension cannot be dialed with only the voicemail box number. You can enter as one leaving a message by dialing *+ box number or you can check the messages by going through the voicemail gateway or dialing 924. Schedules: route callers to different destinations in the organization during specified times and dates. Branch Office: connections provide broadband access to other branch locations by dialing a short access code followed by the extension number. Branch Extensions can also be defined as part of a branch office. These are remote extensions that can be dialed directly as though they were local extensions on your PBX. Branch Extensions also appear in drop down boxes for routing calls to specific destinations.